It was the decided that it will be necessary to move the engine back to make room for the blower and AC. 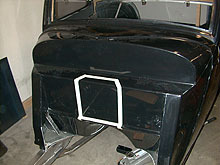 The passenger side valve cover will be approximately 1/2 inch from the firewall. If we were not running AC this would not be necessary because we could run electric fans on the front side of the radiator. My philosophy is that you can always find something to do with extra room in the front of the motor if you move your engine back but it's hard to gain the room in the front that you need if you don't have it. I decided to make room for the distributor and for the fuel lines going to the BDS bug catcher fuel injection, I would recess a 2 1/2 inch deep by 10-inch wide area in the firewall. 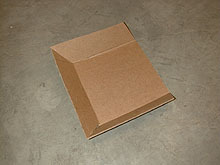 I first made a cardboard template in the design I wanted. I decided to keep the top open to make removal of the distributor easy. 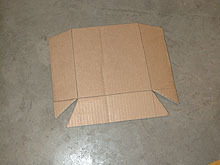 The final shape from the cardboard was then transferred to 1/8 inch non-tempered masonite. The masonite was then scored about half way through and bent just like the cardboard template. There's nothing more fun than cutting up a perfectly good body. 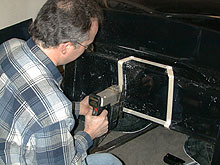 I first drilled half-inch holes in each corner to start the saw and give me a nice round corner. Now it's a 4-window coupe! I have fiber glassed a little before but this is a little more critical then what I've done in the past so I enlisted to help of Joey Keyman of Excessive Auto Sports to help me and give me moral support. 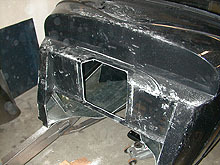 Joey has done a lot of fiber glassing and has worked around street rods all his life. 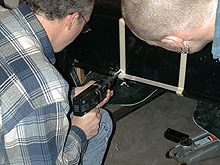 Some of you may remember his dad, Jim Keyman, veteran rodder and Eastern South Dakota NSRA representative who drove his `35 Chevy to almost every event since the first nationals.